In response to a call to its waste, fraud and abuse hotline, the Office of Legislative Audits investigated complaints about contracting at the Maryland Transit Administration, which runs the buses, subway and light rail line in the Baltimore region. “Our review also identified questionable procurement and contract monitoring practices, which may have limited competition and precluded effective monitoring of contracts and related payments,” Hook said. Contracts were issued without proper approval, and payments were made without invoices to back up the work. Four contracts for snow and ice removal totaling $6.2 were issued to a contractor that the project manager had a relationship with. While Secretary Rahn says that his office takes the “findings of the audit seriously,” he has yet to apologize or take responsibility for this occurring in his office on his watch on his pet project. When Gov. Hogan promised to make Maryland more business friendly, presumably he wasn’t talking about featherbedding of the form so appreciated by President Trump. In a meeting with the Montgomery County delegation to the House of Delegates, MTA Executive Director of Transit Development and Delivery Henry Kay cited the Connecticut Avenue overpass as an example of the type of cuts that a bidder for the project might make in order to reduce costs. Gov. Larry Hogan has asked the bidders for the project to find ways to reduce the cost of the proposed light-rail project. However, the directions exclude cutting the length of the line or converting it to a bus-rapid transit (BRT) system. As a result, expensive features like the overpass remain one of the few ways to cut costs. The change would greatly worsen traffic on Connecticut Ave., already bumper-to-bumper during rush hour. 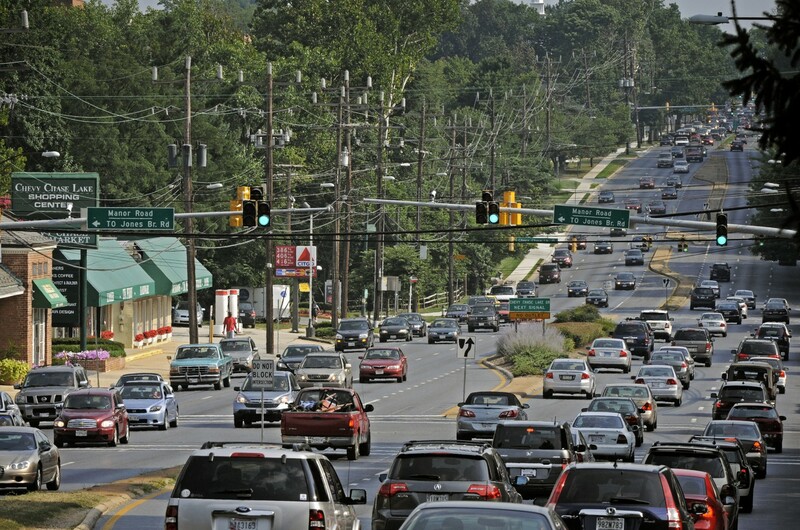 Massive new development slated around the stop at Chevy Chase Lake would exacerbate the problem, as the great majority of new residents along with visitors to commercial properties would still drive. The change would represent a major loss for the Washington Area Bicyclist Association, which has lobbied heavily against any plan to eliminate the overpass in favor of an at-grade crossing. WABA sold the Purple Line to its membership as improving bike travel. The change would mean that not only would there be no fast crossing at Connecticut. Additionally, the current underground bike crossing at Wisconsin Ave. will be eliminated even though the rail line will remain below ground. Why Do Light Rail Costs Only Go Up? The Washington Post reports that cost estimates for the Purple Line in the DC suburbs have risen by $56 million while the Red Line in Baltimore now is estimated to cost another $220 million. Total cost estimates for the Purple Line are now $2.43 billion–more than double the original cost estimates. As with the previous increase, the State must foot the entire bill for the change. Henry Kay, who heads transit project development for the state, said the MTA didn’t publicize the increase because it was considered a “minor adjustment” on such a large, complex project. He said the additional costs came from refined estimates based on more detailed engineering and still-rising real estate prices. Put more bluntly, if MTA is being straight with us, why have the costs continually risen instead of sometimes going down instead of up? And these changes have occurred even as they have tended to take out expensive features, such as the promised continuation of the Capital Crescent Trail through the Purple Line tunnel. It would be useful to hear the Montgomery and Prince George’s County Councils debate what project they would give up to pay for the latest increase in costs even as they figure out how to pay for their share of the project. The Montgomery County Council still has to figure out how to pay for the trail–whose costs have also doubled to $95 million. The County Council also to convince the owner of the APEX building in Bethesda to tear down the building so the station can be built there–something the County is rightly working hard to accomplish (it’s the right place) but will also take money. Will the next increase break $2.5 billion? One question we should’ve asked long ago: at what point does this project in the form of light rail become too expensive, especially since (1) the CCT has already been transmuted from the previously promised light rail into BRT; (2) Montgomery County is planning a countywide BRT system; (3) MTA’s own estimates showed BRT as much more cost effective; and (4) we have many pressing transportation needs, including other public transit investments and the maintenance of existing infrastructure (e.g. Metro and MARC) to make. Good news, however. MCDOT has suspended its previous orders to MTA and is reviewing the situation. They now promise to consult the community in advance of a final decision. This is part of a history of broken promises regarding the Capital Crescent Trail. For example, after repeated assurances that the Trail could be run through the same tunnel under the Air Rights Building as the Purple Line under Wisconsin despite outside claims to the contrary, that was deemed too expensive and removed from the current plan. The County is now trying to persuade the owner of the building over the best location for the proposed Purple Line station to redevelop so that the station, and hopefully a different tunnel, could be built. The building’s owner, unsurprisingly, is holding out for an even better offer since they have the County over a barrel. The MTA just announced that the Record of Decision for the Purple Line has been signed. Formal announcement to follow next week. The final approval of an Environmental Impact Statement which will be issued by Federal Transit Administration. It is a public document that explains the reasons for a project decision and summarizes any mitigation measures that will be incorporated in the project. Obtaining the ROD is the last step in the NEPA process. After a ROD is received, permits and right-of-way can be acquired.